Hear about our latest news, events and funding opportunities. 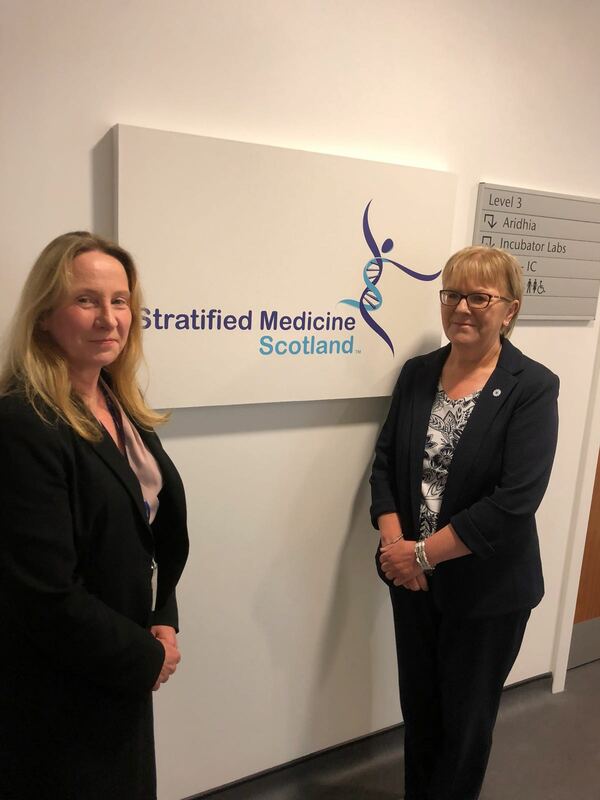 Today (Monday 18 June) MSP Johann Lamont visited the Stratified Medicine Scotland Innovation Centre (SMS-IC) in Glasgow, to see first-hand how it is bringing together industry innovators, clinicians and world-class researchers together to work on precision medicine. Precision medicine ensures drugs are specifically targeted to a person’s genetic makeup rather than a “one size fits all” approach. This helps get the right treatment to the right person at the right time, improving outcomes for patients and slashing the costs of ineffective treatments, saving lives and scarce NHS resources. Based in the University of Glasgow’s Clinical Innovation Zone at the Queen Elizabeth University Hospital (QEUH) campus in Glasgow, SMS-IC is ideally located for access to patients and their data. An industry-led healthcare innovation hub in precision medicine, SMS-IC is one of eight Scottish innovation centres which encourage collaboration between academia and industry, which supports business performance and creates economic value for Scotland. The aim is to help SMEs in precision medicine scale up, by providing expert advice, support and funding that will help businesses leverage other funding and grow. According to Scottish Enterprise, there are over 150 companies involved in precision medicine in Scotland with a turnover of £1.9bn, employing over 9,000 people. Scotland is an ideal location for a “cluster” of precision medicine companies. It has a small, stable population, a single unified health system, world renowned universities, some of the best health data in the world, not to mention a high incidence of complex disease – all the right ingredients for making new discoveries in precision medicine. Johann Lamont, one of Scotland’s most experienced parliamentarians and former Labour party leader visited the SMS-IC as part of her remit as a Glasgow list MSP and deputy convenor of the Education and Skills Committee.